Wow, where did the year go? It's already November and another Wine Wednesday on tap, time to uncork the wine of the week. By the way, you have less than 60 days to get your Christmas shopping done, but don't panic as I've just about to highlight the perfect gift. 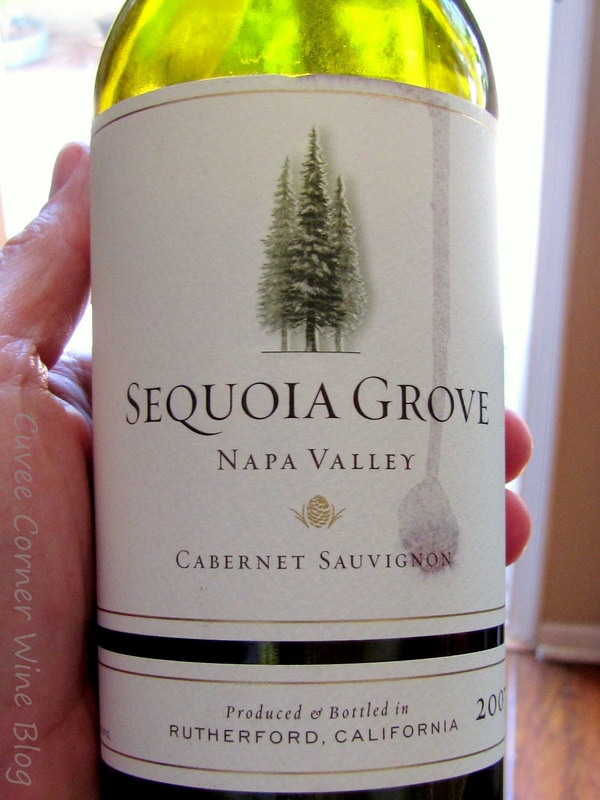 In the spot-light this week is a very tasty Cabernet Sauvignon, from the great folks at Sequoia Grove which occupies a nice 24 acre slice in heart of the Napa Valley's Rutherford Bench district. For the terroir hunter; you'll find abundant alluvial soils, which are known to produce grapes with tendencies to give a distinctive mineral character when made into wine and commonly referred to as "Rutherford dust" a descriptive term you may have seen before applied to wines from this AVA. If you want to get real "nerdy" needing a full explanation, you can pop your cork here. The Norcal wine guy does a great job, giving you an insiders point of view on the topic. I had the good fortune of receiving samples of both the 2007 and 2008 Vintage. One from great folks at Kobrand via Jeff Donegan and one from the "fab" PR group known as Nike Communications via Erin Jaffe. A unique opportunity indeed to explore to very different vintages and one I did not take lightly. So bonus for you today, two wines reviewed for the price of one. Both of the wines in my mind are a great "buy" ready to rock your palate for a reasonable price, both wines have a SRP of $35. But the savvy-shopper can find it somewhere south of $30. I would highly recommend decanting for at least an hour [or more] before hand, as both wines have many layers, which could be more easily unfolded with a little air. Sometimes even we vino-sapiens need a breath of fresh air, well so do some of our wines. This is often the case with Napa-Cab's who are big, brawny monsters that need a bit of time to calm down after they've been uncorked. If you don't have a Reidel, Cabernet Decanter, may I heartily recommend getting yourself one, they really are an indispensable tool, especially if you are buying wines of this caliber. SGCS 2007: A tasty blend of 82% cabernet sauvignon, 12% merlot, 6% cabernet franc, and 6% petite verdot. In the glass a ruby, heading toward garnet. Aromas of dark plum, earth, sweet-vanilla and a hint of bakers chocolate invite my first long, but oh-so serious slurp. Where I'm treated to generous red and black fruits, leather, earthy accents, well integrated easy going tannins, great structure for aging and medium to plus sized finish. I give this wine a score of 91 points, serious sipping here. SGCS 2008: Another tasty blend of 86% Cab. Sauv., 9% Merlot, 3% Cab. Franc, and the odd-man out 2% Syrah, produced mostly from Rutherford fruit [57%]. Described as a difficult vintage due to various factors, spring frost and summer fires filling the air with smoke. In the glass, a shiny ruby colored core, stuffing my fat-Irish nose down in the glass to get a quick whiff, lovely aromatics dusty berries, toast and pleasant herbs. This wine could do with a little more bottle time, but it does have a smooth seductive style, a creamy medley of mocha laced currant, wild berry flavors are shaded by toasty oak, you'll will find the finish long and generous. Despite the challenges it looks like they were able to pull it off, nicely done and I scored this wine 90 points. Give it a swirl, it's a solid Napa Value! Pairing Suggestion: I'm real easy when it comes to pairing; so whenever I'm faced with opening with opening Napa Cabernet, the first thing which comes to mind; is a choice New York strip. My wine of choice happily decanting hours before and then slapping that NYS on a smoking-hot grill for 8 minutes one side on high heat and 4 minutes on the back end to produce medium-rare fresh off the barbie-goodness. Add some fresh potato-salad or fresh-cut french fries into the mix, with a simple garden salad and you have a purple-paved paradise waiting to slap your palate silly. Until next time sip long and prosper cheers! I really enjoyed the 07 and look forward to the 09 once it's released next year. The 09 should be fab, I just uncorked another of the 08's and wow, amazingly good once more, folks really should stock up on this Rutherford gem.